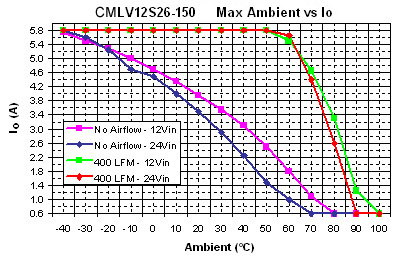 The CMLV series consists of high density, low input voltage, isolated converters on a chassis mount with a wide input voltage range. Low input voltage converters are uncommon in the industry and the CMLV series offers the flexibility of operation with both 12V and 24V busses. These state-of-the-art converters’ features include fast transient response, short circuit protection, over current protection, soft start, and many other features that are required for today’s demanding applications. Dimensions: 5.7in. × 3.4in. × 1.34in. Notes: 1. Logic Enable referenced to -Vin. Active high enable is standard; for active low enable add the suffix “R” to the part number (Ex: CMLV12S15-100R). 2. Pin to pin tolerance: ±0.01" [± 0.3mm], pin diameter tolerance: ± 0.005" [± 0.13mm]. 3. Case material of the DC/DC converter: 0.040" [1.02mm] thick, aluminum alloy 3003-0, per: QQA 250/2. 4. 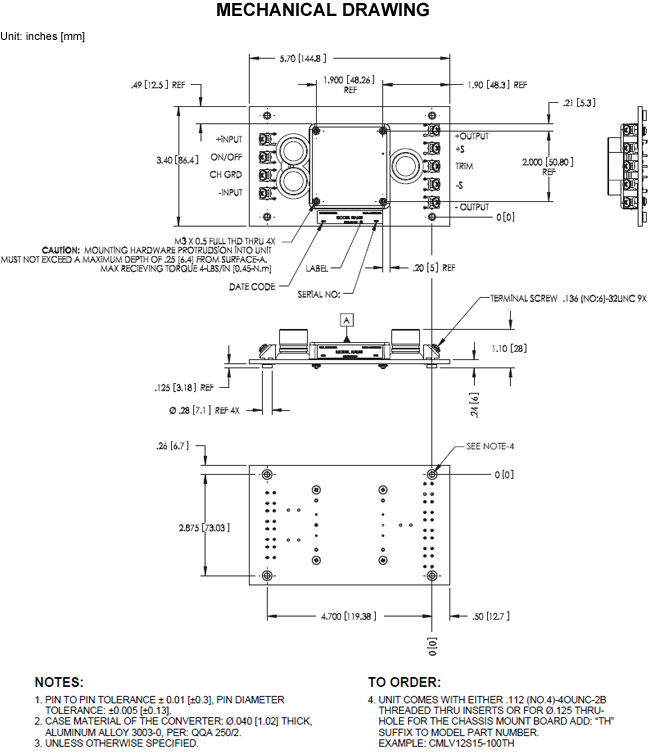 Unit comes with either .112 (NO.4)-4OUNC-2B threaded thru inserts or for Ø.125 thru-hole for the chassis mount board add "TH" suffix to model part number. Ex: CMLV12S15-100TH.